Factory Entertainment creative director Barry Eldridge stops by. For the complete FACTORY ENTERTAINMENT 1966 BATCAVE Index of stories: Click here. 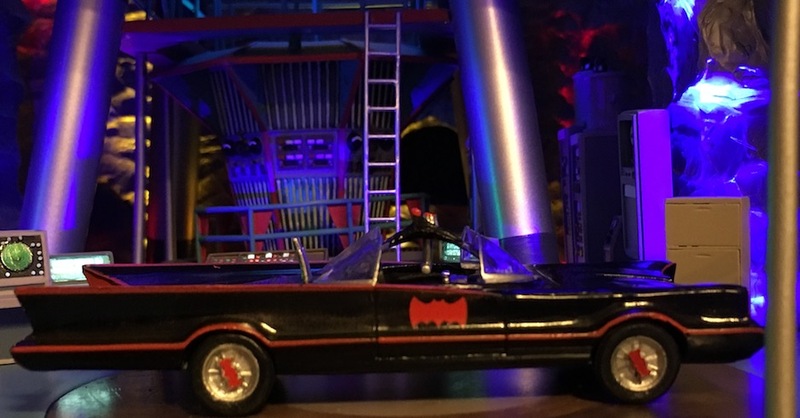 We’ve spent quite a lot of time on Factory Entertainment’s 1966 Batcave model — and with good reason: It’s brilliant. At least the last prototype is. But if the final version is anything like the production model I’ve seen, you’re in for a treat. Still, with less than a week left before the deadline to pre-order directly from the company — which is 9/30 — there are a lot of things to discuss. So Barry Eldridge, Factory’s creative director, joined host John S. Drew and me for the latest installment of The Batcave Podcast. You can check it out here, here or on iTunes. The three of us covered the genesis of the project, the workmanship that went into it, the controversial $799 price tag, and all of the model’s considerable bells and whistles. Not only that, Barry teased what might be coming next. So again, you can listen here or here. And don’t forget to check out our EXCLUSIVE video of the Batcave here and a special SNEAK PEEK of the sculpture here. You know, when I saw the picture of the sculpture above, if I didn’t know better, I’d have thought that WAS an ACTUAL PICTURE of the Batcave set from back in the ’60s!! That just goes to show what an awesome job Factory Ent. has done in producing this piece and replicating the look and feel of the original set. Now I can appreciate why the original set cost $800,000. It was so intricately designed. Bravo to Factory on their great workmanship!! I ordered mine this past Wednesday along with the Gotham City Metal Sign. I spoke with a company rep on the phone and she was very helpful and accommodating, just as you said. I had to work out my finances a little to afford this but am SO glad I was able to make it work! Can’t wait for it to come!! Thanks again both for your help and thouroughly awesome coverage of this gorgeous product!! I just had a chance to listen to the podcast. I hope they do add on components, but only make it available to those that ordered the sets. I think I may have 1/50 scale Batman and Robin figures that sit in the Batmobile, I’ll need to dig them up. I don’t believe anyone will attempt this again – this is once in a lifetime. I know FTC is making one, and while that’s neat, its not as neat is the Dida version, which was in the $300 to $500 range anyway. Thanks for the pics with the 1/50 scale car. I may have some fun with a Pixar tooned version in the Batcave, maybe with a similarly tooned Catmobile.